Quest for Glory II VGA « The MIDI Music Adventure Show! 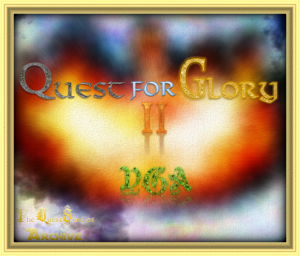 AGD Interactive’s Quest For Glory II VGA soundtrack, by Chris Brayman, Mark Seibert, and Tom Lewandowski. Based on Sierra’s original score with additional arrangements, themes, and enhancements by Quest Studios. Download the complete soundtrack ZIP file! ‡ Indicates a new theme that was not part of the original score, or one that has been updated, altered, or otherwise changed from the original. * Theme taken from “Quest For Glory 1: So You Want To Be A Hero” by Mark Seibert. ** Theme taken from “Quest For Glory 4: Shadows Of Darkness” by Aubrey Hodges. Each track’s “Music Number” corresponds to the song numbering system used in the game. This music is provided for your personal use, not for sale. You may make verbatim copies of it, distribute it in any medium, and play it in public as long as you do not charge money for doing so. You must preserve the artist’s names and title of the music with any copies of the music that you distribute, and make a copy of this licence available with the music. Commercial distribution, commercial public performance, sampling, remixing and derivative versions are strictly prohibited without the artist’s explicit consent. The artists assert copyright on this music. Additional images and artwork copyright ©2007 AGD Interactive, LLC. All rights reserved. Additional music copyright ©2007 Quest Studios. All rights reserved.